I live in the country where it is common to see turtles attempting to cross the road. Most of the time, I'll stop and help them across. However, if there is a vehicle behind me, I'll just hold my breath and hope they make it on their own. Why? Because I like turtles. In fact, I like them so much, that I have 7 of my own! There are several types of turtles in my area. The most common turtle is the red-eared slider. These are the types you purchased at the pet store when you were a child. When kept in a home aquarium, the red-eared slider will stay small. However, in the wild, they can become as big as dinner plates! Red-eared sliders prefer to stay near water, so you'll normally see them on their way to or from a body of water. Another type of turtle is the alligator snapper. These remind me of small dinosaurs because of the ridges along their backs. They aren't very pretty to look at, and are pretty dangerous to handle. I picked one up by the tail while wearing leather gloves, and it tried unsuccessfully to bite off my fingers! Alligator snappers are carnivores, can weigh up to 175 pounds, and have muscular jaws, so keep this in mind when dangling body parts in front of their mouths! My favorite type of turtle is the box turtle, or terrapin. They are plentiful in my area, and I am always on the look out for them. They are easy to raise as pets, since turtles are not demanding in the least! Box turtles are omnivores, meaning they will eat just about anything. If you see them in the wild, they are probably searching for a drink or their next meal. My husband was always amused that I would stop traffic just to save a turtle. One day, he brought home a box turtle, saying he had saved it just for me. How sweet! I promptly put it in the flowerbed, and named it Jimi. Jimi seemed pretty happy. I fed him tomatoes and grapes, and caught grasshoppers and June bugs for him. He became so tame that he would come over to the fence & look up at me. This was my cue to feed him! Texas summers get hot, so I decided to build him a shelter. Gathering old wood scraps, I constructed a simple house where he could get out of the sun. He seemed to like it, and I'd often find him there in the afternoons. I also planted two rosemary plants, and as they grew larger, he would often nap in their shade. But after awhile, I decided that Jimi must be lonely. So I began my search for a turtle friend. It took awhile, but I finally came across a buddy for Jimi one afternoon while driving to town. I picked it up off the road, put it in the bed of the pickup, and gave it a free ride to the store! It didn't seem too pleased to be traveling that way, but it settled down nicely when we got home. Jimi's newest friend was Dylan, and after an hour or two, they became pals. Box turtles are normally solitary animals, but the flower bed is big enough that they were able to set up quarters far enough apart. Box turtles hibernate during the winter, so I gathered a bunch of hay to add insulation to the flower bed. Each night, Jimi and Dylan would disappear under the hay, only to emerge in the afternoons. Finally, it got so cold that they disappeared until spring. Over the months, I kept a constant watch on them. It snowed, and I hoped they were deep enough that they didn't freeze. Lo and behold, in late March, they finally emerged. Safe, sound, and quite hungry! Our friends were amazed and amused that we had managed to keep Jimi and Dylan alive and happy for so long. They got into the spirit of things, and began bring me more box turtles! Over the next year, Jimi and Dylan got 4 new playmates: Mick, Johnny, Jesse and Blue. They settled in nicely, each finding their own plot of dirt and shade. My brother, showing how easy it is to feed my pet box turtles! And Baby Makes It Seven! Raising box turtles has been a learning experience, in more ways that one! It took awhile to realize that Jimi was a she. I guess they didn't like mating in public, so we didn't know for over two years! But Jimi is now a proud mama, as she hatched her first baby this spring! I'm planning on making another flower bed turtle-escape proof, so they'll have more room to roam. 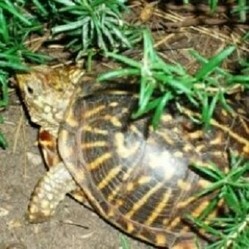 Plus, I may come across another one or two box turtles needing a home, and I need to be prepared! This spring, I had seven box turtles hatch! I have never been more surprised than when they emerged from the hay. They are about the size of a quarter, and so cute. Since I now have 7 adults, in addition to these babies, it is time to make another turtle yard! Have you ever had a pet turtle? Have you ever stopped to move a turtle off the road? What a cute story. Congratulations on your new brood. And thanks for the bit of information about the alligator snapper turtle. I didn't know about them. We had little turtles when we were children; I think they cost a quarter. My parents had a small garden in the back yard and terrapins would eat the tomatoes. Turtles can be interesting as a pet. And they are not much trouble.